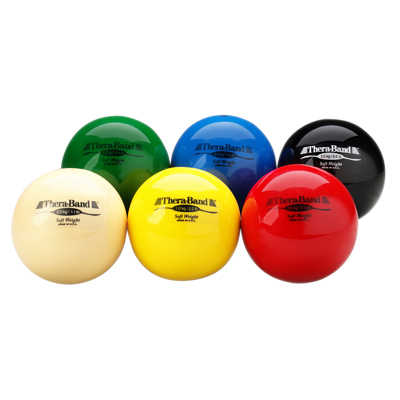 Thera-Band® Soft Weights are hand-held, ball-shaped isotonic weights – a soft alternative to traditional isotonic dumbbells providing users more versatility for strength training and rehabilitation exercises. 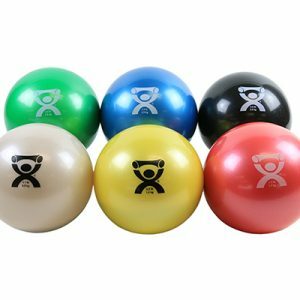 They are unique because the size of the ball, with a diameter of 4.5″, does not increase as weight increases, allowing for a consistent and functional grip. 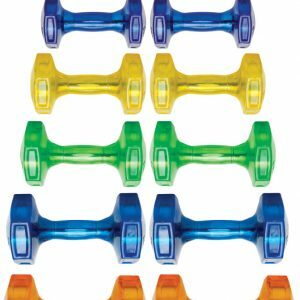 This allows for either unilateral or bilateral exercise progressions, either independently, or with a partner.Thera-Band® Soft Weights are designed for applications in therapy or fitness, including strength training, plyometrics, balance and stabilization training, mobilization, or functional implement training. 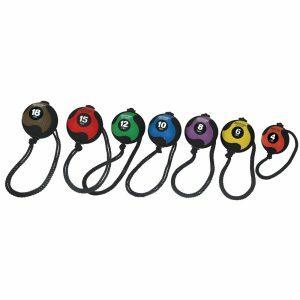 SET OF 6 includes 1 of each weight. 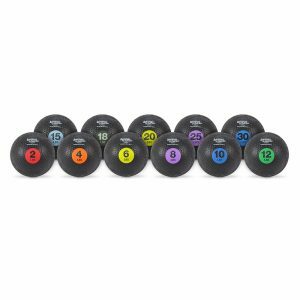 Soft Weights follow the Thera-Band system of progressive exercise and are available in six color-coded weights, ranging from tan (½ kg/1.1 lbs), to black (3 kg/6.6 lbs), increasing in 1/2kg/1.1 lb. increments. Thera-Band®Soft Weights allow users to increase weight in resistance training and rehabilitation programs without changing grip or technique, which is fundamental to the principles of progressive exercise.Their soft texture allows for functional grip or exercises for individual fingers which aid in hand and wrist rehabilitation. Each Thera-Band Soft Weight is accompanied by a guide that demonstrates a variety of proper exercises.